The group sits around a table in a library singing. It’s kind of adorable. There are eight of them, two voices per section: soprano, alto, tenor, and bass. Opus 8 is two years old now, the baby of choral singers in the city who wanted a new and different challenge. As they sit around, in a circle, it’s like watching a spiritual exchange. Many of the ensemble are singers of St. James Cathedral’s choir. The church’s music director is Robert Busiakiewicz, also the leader of Opus 8. He’s a British trained tenor, conductor and composer who studied at the Royal Academy of Music, King’s College London, and King’s College, Cambridge University. Busiakiewicz’ fellow Opus8 members have similarly impressive musical resumes – and the partnership between St. James and Opus 8 has allowed the choir to flourish. This concert is full of polyphony, mostly liturgical settings of Agnus Dei. The core message here is one of peace, pacifism and harmony. Coming the day after the presidential inauguration of Donald Trump, it is an invocation that feels especially timely. At this rehearsal, Opus 8 begins with Leonard Bernstein’s Agnus Dei from his Missa Brevis. A not often performed (or well-known) Bernstein work, the piece is dissonant and features a countertenor solo, for which Simon Honeyman takes the reins. It’s actually a giant bubble of sound listening to them, incredibly loud in the bare room, too few books and soft spaces to offset any of the harmonics. I’m not convinced at first on the sounds I’m hearing; there’s just a lot of it at this point. There isn’t much to say about the rehearsals for Opus 8. When musicians perform at this high a level, it just sort of goes. Clarifications on dynamics and pitches are few. This is an advantage to singing in a smaller group: one can hear oneself within the texture of the music quite clearly. Similarly, one stands out quite noticeably if inconsistent with the group. Mistakes are noted and addressed quickly. The compositions, while thematically linked, are quite demanding for the ear – but the programming is dynamic. 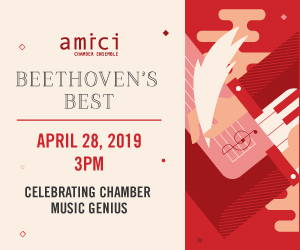 Cognitively engaging for the singers and for active listeners, this concert will be heavy on sound, lots of it, constantly moving – with a lot of those unusual intervals characteristic of medieval and renaissance music. person); Josquin des Prez’s Missa L’homme Armé from the 15th century; and John Tavener’s The Lamb, to name a few. I doubt many local groups have ever programmed a choral concert like this in Toronto, or at least brought it to fruition. About 40 minutes into rehearsal, the choir pushes their chairs back and stands. They start on Philippe Rogier’s Agnus Dei from the 16th century Missa Ego sum qui sum. That’s when I hear it, the sound. Their voices blend together into this heavenly polyphonic magic. It’s watermelon jello: clear, perfectly settled, vibrating just a bit as you look at it, sweet and gentle, just waiting for you to dig in. The tempo slows unintentionally, as the voices meld together (as Busiakiewicz notes). But it’s there, the sound that every choir, anywhere, tries to reach. Most choirs aren’t successful; Opus 8 is. There’s also a piece of Busiakiewicz’s from a 2013 commission he prepared for Massey College. He explains that “one of the things this piece explores is how to place three adjacent notes together and try and make it sound beautiful.” The song has many suspensions, longer tonal lines with various voicings moving in and around to create the intended effect. It’s unsettling and incredibly challenging. Later in the rehearsal, Busiakiewicz speaks to me about his approach to choral music. For him the goal is to “present repertoire not being heard or being heard at a high level in Toronto...and to provide the highest quality performance to as wide an audience as possible.” He also speaks of choral music as being able to do anything: not just “soft and lovely” but also having the capacity to be “shocking” and “disturbing”. His own composition embodies this, a sacred setting that I find musically disturbing. That isn’t a judgment on its merit, but its effect. Ultimately, Busiakiewicz’s programming aims to “keep the choir engaged and interested.” It works. I am engaged listening to them rehearse. My brain is working overtime, listening, processing, analyzing, thinking and identifying. I see the members of the ensemble working the same way. They’ve clearly latched onto something. Not everyone spends Friday nights rehearsing; but these eight musicians do, so there’s definitely something there, around the table in the library. Opus 8 presents Dona Nobis Pacem on Saturday, January 21, at 7:30pm at Church of St Mary Magdalene in Toronto. For more information, visit www.opus8choir.com.